Awhile back I wrote a post about a Moda Layer Cake that I purchased without really having plans for it. It was just too pretty to pass up! I wanted to make a quilt, but I was very nervous about starting a quilt, messing it up, and not being able to showcase this beautiful fabric all together. Simply using a little for this and that wasn’t what I had in mind. 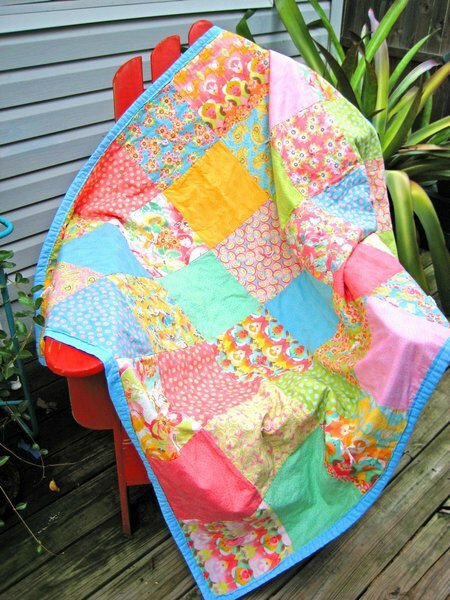 I scoured numerous quilt blogs and found one that I could handle. I’m not the craftiest sewer on earth, so I need to keep it simple. 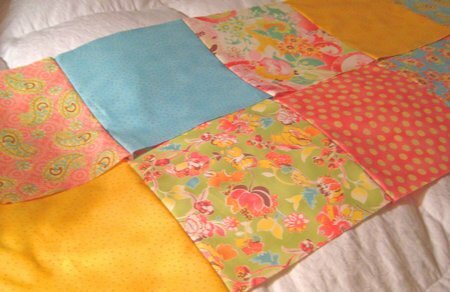 Cicada Dreams has a wonderful tutorial that made it possible for me to complete this quilt. That’s it! A tie quilt was the way to go for my first quilt! It gets used often and I’ve never ironed it. That’s why it’s a little wrinkled…but loved. That’s the way we like things around here. I ironed. I normally hate ironing, but it’s much nicer when you’re working on a project with beautiful material. The colors make me happy! 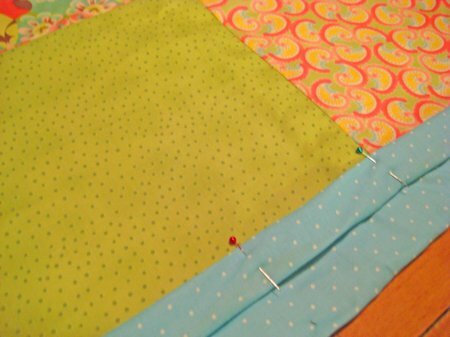 I pinned the strips together and started sewing them together one at a time. I got to use my little strawberry pincushion that I made a couple months ago. 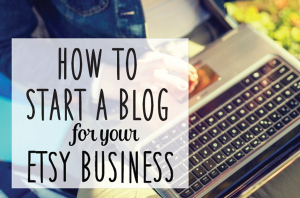 It helped me to at least look like I knew what I was doing. I felt like I was making progress quickly and I was having fun. Then it was time for another trip to the store for the backing and more stuff. That really slows things down! Don’t you wish they delivered??? This is a photo of my not-so-evenly cut layers. I was starting to get a little tired, but I really wanted to finish! As you can see, I am not a perfectionist! It finished up much easier than I thought it would. I didn’t happen to take any photos of it on my floor with the spray adhesive causing the layers to stick together wrong. That would be funny now, but at the time I was a little stressed. I suggest spraying adhesive LIGHTLY! Once I finished all my sewing, I sat and watched a movie with everyone while I tied the knots with yarn in every other square. I can’t imagine what it’s like to hand quilt! The amount of work involved in that is amazing, and I have trouble just working on the same project for more than a few days. Thanks for everyone’s comments on my earlier post asking what I should do with this fabric. Your information was so helpful! 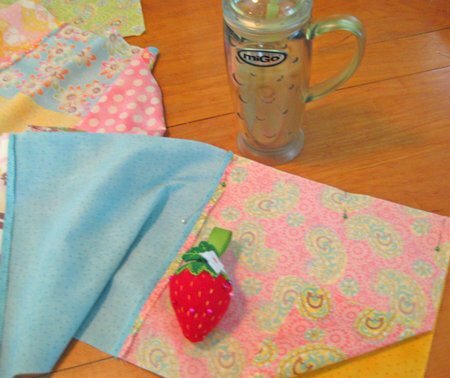 If you have any links to quilts you’ve made, just leave them in the comments today so I can come see! Here it is again! It fits in perfectly in our colorful house, and I’m sure it will be around forever! There’s such a sense of accomplishment when you’re finished. 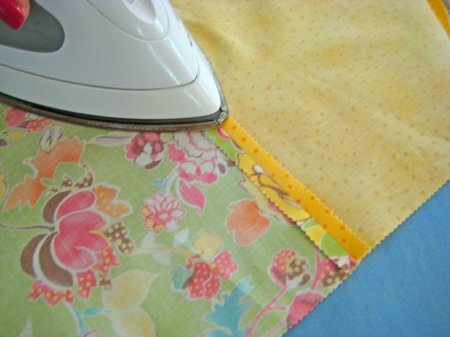 I can see why people like quilting so much! I’m planning on making one for our bed…King size. It’ll be in all cream colored fabrics. Wish me luck! Congratulations!!!! It is beautiful. And HAPPY! I love it!! You are now officially a “quilter”. Blessings! Congrats on the quilt! It looks great! Oh Kim, you did a marvelous job. I love your quilt of many colors …. and you know, there are plenty of fabric stores that DO deliver! HA! What collection are you making the King size with? You should be bursting with pride. It’s wonderful! Kim! This is beautiful! A big high-five for tackling this project! I love your sense of humor and the way you write your posts… very excited to work with you really soon. 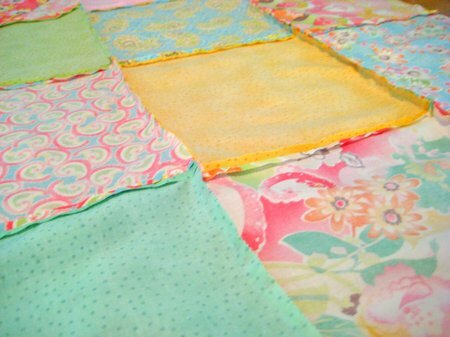 I haven’t made a quilt since I’ve become “Gussy”. I made one maybe 5 years ago with Zack’s mom and grandma. Super fun! Very cute and inspiritational!! 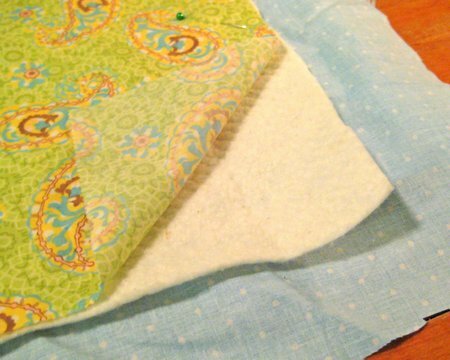 I have a stack of beautiful fabric fat quarters and other sizes and have no excuse because I have quilted before…now to get to it!! 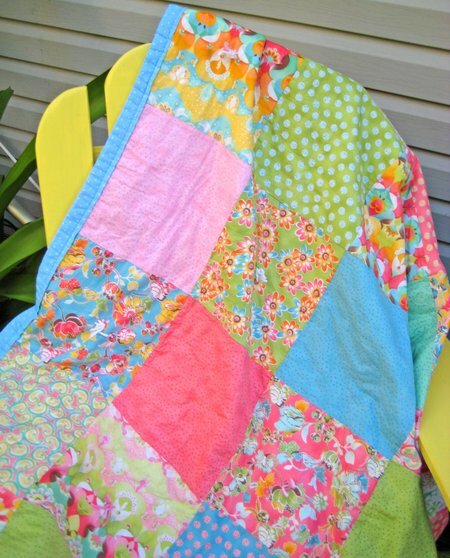 Just love your quilt…the colors are soooo yummy! Oh, it turned out beautiful!! That is a very happy quilt! 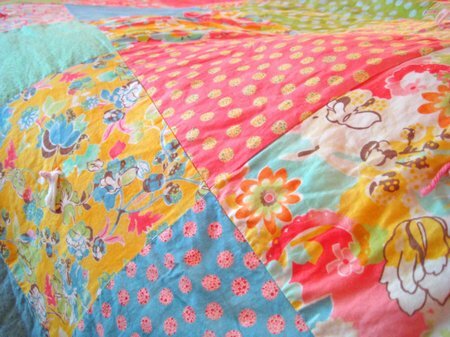 Everyone needs happy quilts in their life!!! I love these fabrics. I looked on the Moda site but can’t figure out which ones you used. Do you remember the name of them? Thanks! 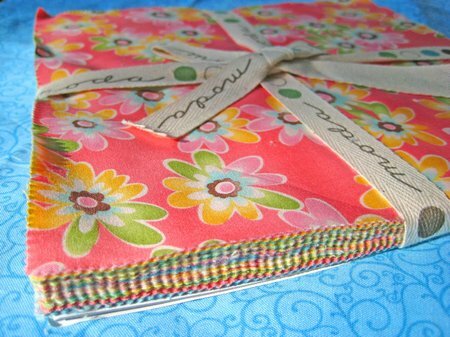 Does Moda sell her precut quilt squares through her website or only in store? 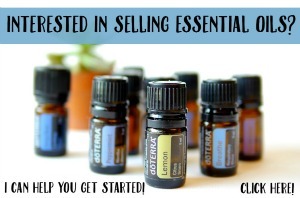 It’s just that I looked through her entire website and there isn’t anything for purchase it seems like. Please let me know! !